Middle Georgia State University will soon make all courses required to earn a Bachelor of Arts in History available at the Cochran Campus. Dr. Matthew Zimmerman, chair of the Department of History and Political Science, said that beginning spring 2017, students on the Cochran Campus will have the opportunity to earn the four-year degree through taking face-to-face courses with faculty on site. They will not have to travel to any of the University’s other locations to complete the program. The Bachelor of Arts in History was one of the degrees offered by the former Macon State College, which in 2013 consolidated with Middle Georgia College based in Cochran to become what is now Middle Georgia State University. History courses that are part of the core curriculum have always been available on the Cochran Campus. This new development means that upper-division courses – those generally taken in the junior and seniors years – will also be available. The History Student Organization is one of the most active clubs on the Macon Campus, and Zimmerman hopes that history majors based on the Cochran Campus will develop a chapter. Middle Georgia State University’s Bachelor of Arts in History offers two tracks: traditional and secondary education. The traditional track is aimed at students interested in careers in the arts, law, government and community service, historical interpretation and museum work, as well as graduate study. The secondary education track prepares students to teach history at the high school level. Students in both tracks study primary historical sources extensively and learn to read critically and write analytically. Some of the degree program’s core courses are available online. For more information, email Dr. Andrew Reeves at andrew.reeves1@mga.edu or Zimmerman at matthew.zimmerman@mga.edu. The History and Political Science department’s webpage is at http://www.mga.edu/arts-sciences/hist-pols/default.aspx. Middle Georgia State University has campuses in Macon, Cochran, Dublin, Eastman and Warner Robins. 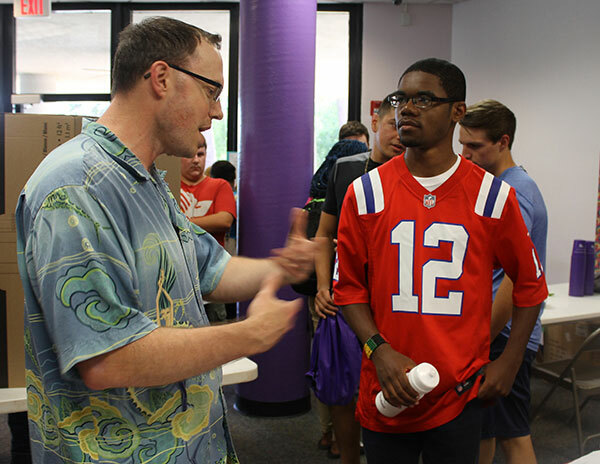 Photo: Dr. Andrew Reeves of #MGA's history faculty talks to a student on the Cochran Campus.